It may look more like a perplexing work of avant-garde sculpture than it does a telescope, but make no mistake about it–the golden snowflake on a surfboard that is the James Webb Space Telescope will be the premier eye in the sky of the next decade. With the assistance of the Webb, astronomers hope to take a giant leap forward in understanding the origins of the cosmos. 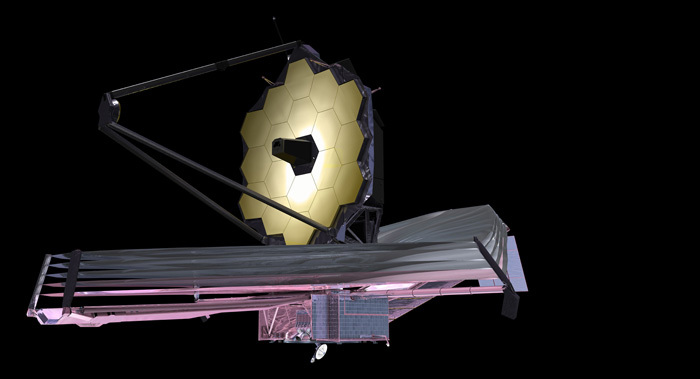 It trumps all previous space telescopes by virtue of its 18 hexagonal reflectors, which combine to form a huge mirror roughly seven times larger than that of the Hubble Space Telescope. This will allow it to collect far more light to see with, enabling it to peer at the most distant objects in the universe. Since light travels in time as well as space, the further away the James Webb Space Telescope can see, the further back in time it can look, granting the world unparalleled glimpses of the light from the first galaxies. This next-generation space observatory will yield vital clues about every stage in the history of the cosmos, from the formation of the universe to the evolution of our own solar system. Expected to launch in 2014, NASA has allowed us sneak peeks at how one goes about building a successor for Hubble. The primary mirror of the observatory gathers light from its targets, reflecting those rays onto a secondary mirror in front of it. That secondary mirror then bounces the light through a hole in the primary mirror and ultimately onto the sensors of the telescope’s scientific instruments. With a primary mirror 21 feet 4 inches wide, the Webb is capable of peering at the first galaxies that formed just after the Big Bang, ones now more than 13 billion light years away. No mirror this large has ever been launched into space before–it will be folded like a drop-leaf table so that it can fit into a rocket, and then open up after launch. The telescope is named after James E. Webb, who served as the administrator of NASA from 1961 to 1968. Under his direction, NASA took on a great challenge: fulfilling President Kennedy’s pledge to land Americans on the moon by the decade’s end. The primary mirror is made of 18 hexagonal segments that act together as a single mirror. The segments are each 4.26 feet wide and made from the rare metal beryllium, which is both strong and very lightweight; each mirror segment weighs just 46 pounds. Special care has to be taken when handling beryllium since beryllium dust is toxic, especially when inhaled, and long-term exposure is known to cause cancer. Once each mirror segment is smoothed and polished until it’s nearly perfect, a thin coating of gold is applied, which improves how the mirror reflects infrared light. Afterward, each mirror segment is transported to Marshall Space Flight Center’s X-ray and Cryogenic Facility, where it’s cooled down to see how it performs at -370 degrees Fahrenheit, the kind of extreme cold it will experience when the Webb is deployed to deep space. The cold must not cause even minute changes in the segment’s shape, or the telescope’s readings will be thrown off. Work on the James Webb Space Telescope takes place in the largest cleanroom of NASA’s Goddard Space Flight Center. Cleanrooms are like operating rooms in hospitals–pristine areas kept as free of contaminants as possible, since even one speck of dust or an oily fingerprint could severely damage the observatory’s sensitive components and instruments. Scientists and engineers who work in cleanrooms have to wear sterile bodysuits, head covers, gloves, boots, and face masks. At the same time, the ventilation systems of Goddard’s largest cleanroom circulates nearly 1 million cubic feet of air each minute through 9,000 square feet of filters located along one wall. This provides the cleanroom with a Class-10,000 rating, meaning that any cubic foot of air contains no more than 10,000 particles larger than a half-micron (that’s about 200 times narrower than a human hair). Air typically has millions of such particles. The primary mirror of the telescope is mounted on its large, sturdy “backplane,” which must support the 21-foot-diameter reflector as well as another 7,500 pounds of optics and instruments. It holds 12 segments in the middle part of the mirror and has two wings with three segments each. These wings fold back to help the mirror fit into a rocket. (There will be no mirror segment in the central hole, where the technician is standing; optical data will be sent through that aperture to the scientific instruments.) This photo actually shows a mock-up of the backplane, which engineers use to check practice handling, installation, and alignment procedures. The backplane is made of advanced graphite composite materials jointed to fittings and interfaces made of titanium and a nickel steel alloy known as invar, which is notable for expanding very little due to temperature changes. Even at temperatures below -400 degrees Fahrenheit, the backplane is steady down to 32 nanometers, or less than a thousandth the diameter of a human hair. It must essentially hold the mirror motionless as it peers into deep space, just as a camera sometimes needs a tripod to hold it steady–any shaking makes it much harder to focus on an object. To detect faint infrared light from the extraordinarily ancient, distant objects that are the telescope’s primary targets, its sensitive mirrors and instruments must be cooled below -370 degrees Fahrenheit. The observatory’s sunshield, which is the size of a tennis court when fully deployed, helps keep these instruments in the shade, protecting them from the heat of the sun and the hotter parts of the telescope. 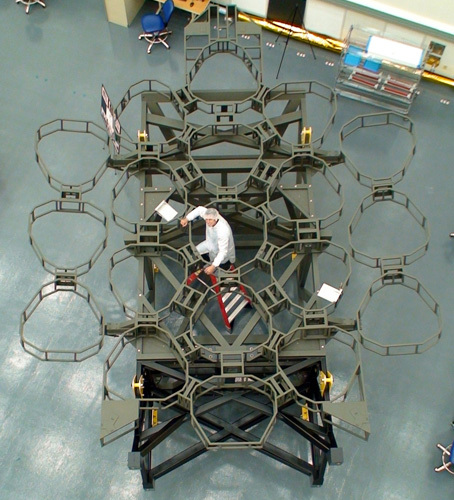 This photo shows a one-third-size sunshield layer undergoing tension testing. The Webb telescope will be oriented so that the Sun, Earth and Moon are always on one side of it, allowing the sunshield to act as a parasol, NASA says. The complete sunshield consists of five thin reflective layers of plastic that bounce heat back into space–and any energy they do absorb radiates out between the layers. Each layer is cooler than the one below it, overall conducting less heat than a single thick layer would. The observatory’s Near Infrared Spectrograph allows it to scan the spectra of light from more than 100 objects at once, which can reveal details about their physical properties, including temperature, mass, and chemical composition. However, the instrument needs a way to block out the light of near, bright objects to properly analyze its faint, distant, ancient targets. Enter the microshutters–tiny cells just 100 by 200 microns large, or one to two times the width of a human hair, respectively. These shutters can be individually opened and closed when a magnetic field is applied, in order to view or block a portion of the sky. These cells are arranged in a waffle-like grid about the size of a postage stamp that holds more than 62,000 microshutters. The instrument will contain four of these grids altogether. A full-scale model of the James Webb Space Telescope was built to show people just how large and complex the satellite really is. The model, made up mainly of aluminum and steel, weighs 12,000 pounds and is approximately 80 feet long, 40 feet wide, and 40 feet tall. It requires two trucks to ship it, and assembling it takes a crew of 12 people approximately four days. NASA may have decided to show off the Webb model in order to gain support for the mission, which has recently come under criticism. An independent review (pdf) of the project declared that the telescope will likely be late and over budget. Judging from the rate of progress and expenditures, the review panel said, the telescope won’t be ready in 2014, and probably won’t launch until September 2015. The panel also revealed that the price tag, originally estimated at $5 billion, is likely to climb to $6.5 billion. This has other NASA researchers worried that their own projects will be canceled to pay for Webb. NASA administrators promised to look into cost-cutting measures for the telescope, but they also affirmed that while Webb may be expensive, it will also be worth it. To make its observations in faint infrared light, the Webb needs to be cooled to just a few tens of degrees above absolute zero. To accomplish this goal, it will dwell in deep space well beyond the orbit of the moon, at one of the so-called “Lagrangian points.” At this spot, known as L-2, the gravitational pull of the sun and Earth balance out. That will allow the spacecraft to remain in the same position relative to the Earth and sun with little effort; that’s important because Webb needs to keep these bodies on the same side of the spacecraft in order for its sunshield to be effective. Once Webb blasts off on top of a rocket, the telescope will take three months to reach its orbital parking spot, roughly 1 million miles from Earth.